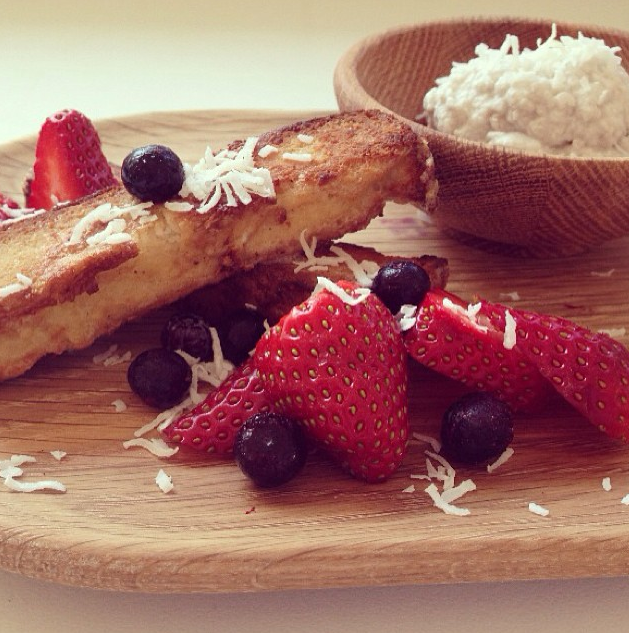 So this recipe started out as a pancake experiment and ended up as coconut french toast. Needless to say my pancake skills are not quite up to scratch and the batter I made just did not want to be a pancake when it grew up. In a huge effort to offer this batter a successful career I poured it into a bread tin and shoved it in the oven. It blossomed, found its true calling, and out came this yummy coconut bread! You can absolutely munch on the coconut bread by itself but I find it’s better toasted in the oven and even better made as french toast! Pre-heat the oven to 180 celsius. Grease and line a standard loaf tin. Whisk together eggs, milk and vanilla. Stir in flours and baking powder until combined. Pour into loaf tin and bake for 40 minutes, until a skewer comes out clean. For the french toast whisk together the egg and coconut milk in a shallow bowl. Soak slices of coconut bread in eggy mixture for a couple of minutes each side. Melt some coconut oil or butter in a small pan over medium heat. Add your eggy coconut bread slices to the pan and cook for about 1-2 minutes each side, until nicely browned. Serve hot with fresh berries, coconut cream and shredded coconut. Enjoy! Oh great for a breakfast treat, thanks for sharing.